An exquisite unrepeatable ‘Royal’ painting made on location by Gordon Frickers 25 x 35 cms (9¾” x 13¾”), available, £1,200. To put it mildly, it is very unusual for several reasons, not least to see a painting of the Royal family at play. Also it is very unlikely I will ever paint on location again at a major regatta. Prince Phillip in particular has made a considerable contribution to Cowes week, not only its’ ambiance, also its’ organization. 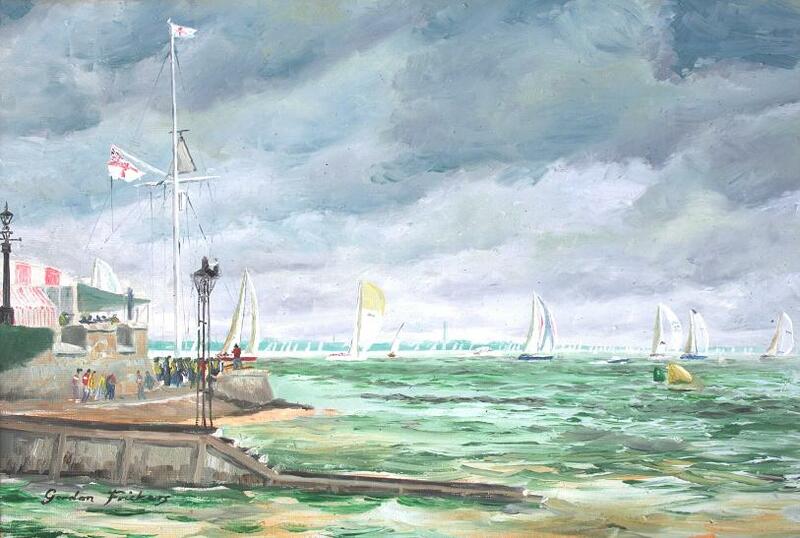 A small yet I hope you agree, a beautifully executed painting of Royalty relaxing with Friends, Cowes Week Regatta, “Yeoman XXVIII” at that time owned by the Aisher family racing with Prince Phillip at the helm. Painted on location as the race unfolded, the yachts are in the correct order for moment of the day as they swept past the Esplanade and Royal Yacht Squadron clubhouse. Cowes Week is THE major Regatta of the British summer (and seen here on a typical British summer’s day!) and has been so since long before the Schooner “America” raced there and won the cup now the most famous trophy in sailing and known as The America’s Cup. This is a previously un-published painting, created on location during the race, a good ‘party trick’ to amaze onlookers and a few people since, it was created at the invitation of Paul Bertie of Ocean World West Cowes, he paid my expenses, thank you Paul, who later had a 20″ x 32″ version of this study painted for his office. Like the man said, … souvenirs of a great week, a typical English summer day, and a fine spirited painting.